The prospect of an El Niño event in the Pacific Ocean always generates a stew of excitement, dread, and speculation in California. This largely stems from the fact that two of California’s wettest winters on record — 1982-1983 and 1997-1998 — occurred during the strongest El Niño years in living memory. The popular perception that El Niño always brings a lot of water to the Golden State, though, is not particularly accurate. The key message here: strong El Niño events are the ones to watch out for from a California weather perspective, and it’s reasonable to expect that such events greatly increase the odds of wet conditions throughout the state. Depending on how you measure it, the present El Niño is either the strongest or among the strongest events in the observed record going back to at least 1950. Ocean temperatures in the eastern equatorial Pacific Ocean — the most traditional measure of El Niño’s amplitude — have been at or above record-high values for at least several months now. So despite assertions to the contrary, the 2015-2016 El Niño is not “a bust” by any means. But absolute sea surface temperatures don’t always tell the whole story. While the present El Niño is indeed among the strongest ever recorded, the atmospheric response to the warm ocean temperatures this year has been a bit different than we have observed during other big historical events. Over the northeastern Pacific, El Niño acts to deepen the semi-permanent Gulf of Alaska low-pressure zone while simultaneously strengthening (and, literally, straightening) the jet stream over the eastern Pacific Ocean. This enhanced and “more zonal” (i.e. more west-to-east) jet stream is what tends to bring increased winter precipitation to California (and, sometimes, as we're seeing now, even the Pacific Northwest) during strong El Niño years. These atmospheric effects are the product of a fairly complex chain of events that link the tropical to the mid-latitude atmosphere. Warmer-than-usual ocean temperatures in the eastern tropical Pacific increase thunderstorm activity there, which pumps vast quantities of heat into the upper atmosphere. This tropically warm air at upper levels eventually flows northward and drops back toward the surface of the Earth in the subtropics (at a latitude roughly equivalent to that of Hawaii). This enhanced “Hadley circulation” during El Niño years increases the temperature differential between the warm tropics and cool Gulf of Alaska, which is what causes the jet stream to strengthen. In late 2015 and early 2016, the atmosphere has responded to the ongoing powerful El Niño much in the way that meteorologists have come to expect. The Pacific warmed; tropical thunderstorms increased; the Hadley cell strengthened; the Pacific jet began to roar. But this year, the Hadley cell has actually strengthened a bit more than expected. The descending air on its northern side has occurred closer to California, which means that enhanced temperature differential is occurring farther to the north than during previous big El Niño events. Subtropical ridging between Hawaii and California has been more pronounced, and the El Niño-strengthened jet stream has set up shop primarily across Northern California and even the Pacific Northwest, rather than Southern California. From a global climate perspective, this is a relatively minor detail; if you happen to live in Los Angeles, though, it makes all the difference in the world. The net effect so far in 2015-2016: Northern California and the Pacific Northwest have gotten soaked, while Southern California has been left pretty dry (with a few notable exceptions). While a veritable “parade of storms” has indeed inundated the northern reaches of the state with very heavy precipitation, bringing the best Sierra Nevada snowpack in years, leading to huge inflows to large reservoirs in critical watersheds, and even leading to some minor flooding at times, many of California’s most populous cities haven’t witnessed an especially remarkable winter to date. The San Francisco Bay Area and Sacramento region have seen “Water Year” precipitation to date that is pretty close to the long-term average (which seems like a lot relative to the extremely dry years witnessed as of late). The densely populated greater Los Angeles region, on the other hand, is well below average for the season to date (though with significant precipitation this past weekend, its January total may well end up near or above average). From a long-term drought relief perspective, the season to date looks pretty good—precipitation is near or above average in most of California’s largest watersheds, and the water stored in the critical Sierra Nevada snowpack is uniformly above average. So far, though, this isn’t quite the blockbuster year that many had hoped for (especially in the south). El Niño is certainly still with us, and it’s still a top-tier event. For that reason, the smart money’s still on a wetter-than-average season for California on balance. This is especially true since the precipitation during strong El Niño years is often heavily “back-weighted,” with an unusually large fraction of seasonal totals occurring during the second half of the rainy season from February to April. What is less clear, at this point, is whether the northerly-shifted atmospheric response to this El Niño will persist — and whether Southern California will start to make up for lost time. It’s certainly possible, and it’s easy to forget that a surprisingly large fraction of precipitation in the Southland occurs during a handful of intense storms each year (even in strong El Niño years). From a statewide perspective, some substantial drought relief has already occurred this year, but there remain large regions in the southern part of the state that are still extremely dry. The refrain from earlier in the autumn is now more relevant than ever: while El Niño is likely to bring some degree of drought relief, California will likely still be facing long-term drought conditions by the coming summer. Finally, there has been considerable discussion lately regarding why the atmospheric response to El Niño this year has been different than historically observed (and also than foreseen by some of the flagship seasonal forecast models). It’s impossible to ignore the fact that global temperatures in late 2015 and early 2016 have reached their highest levels in recorded human history. Part of this very recent warming is likely a product of our record El Niño event, but the rest is pretty clearly attributable to the long-term warming trend associated the with human emission of greenhouse gases. While global mean temperature doesn’t directly affect El Niño teleconnections, per se, the Earth hasn’t been warming in a spatially uniform way. This year in particular, the subtropics and the polar regions have been especially warm relative to other parts of the world. It is possible that this spatial pattern of warming may be playing a role in the particular atmospheric configuration that has resulted from the 2015-2016 El Niño event. Unfortunately, it is virtually impossible to say more than that right now. The pace of climate change attribution science is much slower than that of the atmosphere itself, and it’s hard to make causal inferences from observations alone. 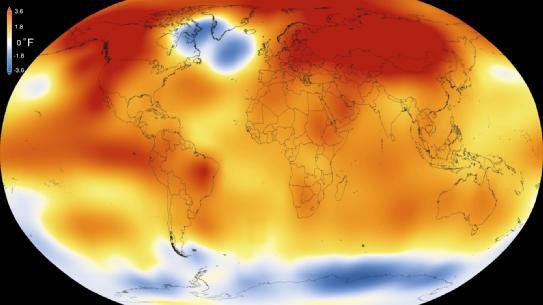 Climate models are often the best tool available for climate scientists to test the counterfactual: what would this year have looked like without global warming? Such experiments take a considerable amount of time, so we’ll probably have to wait a while to find out. Stay tuned.